The Grand Kremlin Palace, also translated Great Kremlin Palace, was built from 1837 to 1849 in Moscow, Russia on the site of the estate of the Grand Princes, which had been established in the 14th century on Borovitsky Hill. Designed by a team of architects under the management of Konstantin Thon, it was intended to emphasise the greatness of Russian autocracy. Konstantin Thon was also the architect of the Kremlin Armoury and the Cathedral of Christ the Savior. Terem Palace or Teremnoy Palace is a historical building in the Moscow Kremlin, Russia, which used to be the main residence of the Russian tsars in the 17th century. Its name is derived from the Greek word τερεμνον. Currently, the structure is not accessible to the public, as it belongs to the official residence of the President of Russia. The Ivan the Great Bell Tower is a church tower inside the Saint Basil's Cathedral complex. With a total height of 81 metres (266 ft), it is the tallest tower and structure of Kremlin. It was built in 1508 on Cathedral Square for the three Russian Orthodox cathedrals, namely the Assumption, the Archangel and the Annunciation, which do not have their own belfries. 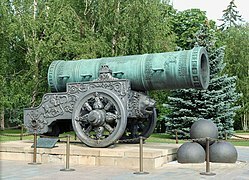 It serves as a part of Moscow Kremlin Museums. The following is a list of towers of Moscow Kremlin. The Kremlin Wall is a defensive wall that surrounds the Moscow Kremlin, recognizable by the characteristic notches and its towers. The original walls were likely a simple wooden fence with guard towers built in 1156. The Kremlin is flanked by 19 towers with a 20th, the Koutafia Tower, not part of its walls. The Cathedral of the Archangel is a Russian Orthodox church dedicated to the Archangel Michael. It is located in Cathedral Square of the Moscow Kremlin in Russia between the Great Kremlin Palace and the Ivan the Great Bell Tower. It was the main necropolis of the Tsars of Russia until the relocation of the capital to St. Petersburg. It was constructed between 1505 and 1508 under the supervision of an Italian architect Aloisio the New on the spot of an older cathedral, built in 1333. Now it also serves as a part of Moscow Kremlin Museums. Novodevichy Convent, also known as Bogoroditse-Smolensky Monastery, is probably the best-known cloister of Moscow. Its name, sometimes translated as the New Maidens' Monastery, was devised to differ from the Old Maidens' Monastery within the Moscow Kremlin. Unlike other Moscow cloisters, it has remained virtually intact since the 17th century. In 2004, it was proclaimed a UNESCO World Heritage Site. Krutitsy Metochion, full name: Krutitsy Patriarchal Metochion is an operating ecclesiastical estate of Russian Orthodox Church, located in Tagansky District of Moscow, Russia, 3 kilometers south-east from the Kremlin. The name Krutitsy (pl. ), i.e. steep river banks, originally meant the hills immediately east from Yauza River. Krutitsy Metochion, established in the late 13th century, contains listed historical buildings erected in the late 17th century on the site of earlier 16th century foundations. After a brief period of prosperity in the 17th century, Krutitsy was shut down by imperial authorities in the 1780s, and served as a military warehouse for nearly two centuries. It was restored by Petr Baranovsky and gradually opened to the public after World War II; in 1991-1996, Krutitsy was returned to the Church and re-established as the personal metochion of Patriarch of Moscow and all Russia. Ascension Convent, known as the Starodevichy Convent or Old Maidens' Convent until 1817, was an Orthodox nunnery in the Moscow Kremlin which contained the burials of grand princesses, tsarinas, and other noble ladies from the Muscovite royal court. 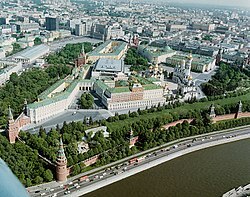 The Kremlin Presidium, also denominated Building 14, was an edifice within the Moscow Kremlin in Russia. 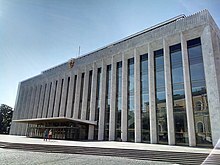 Constructed in 1934, until 2011 it housed, first, the Supreme Soviet, i. e. the supreme legislative body of the Soviet Union until its dissolution in 1991, and, second, the offices of the Presidential Administration of Russia. It was demolished in 2016. Saint Sophia Cathedral is a Russian Orthodox cathedral, the oldest surviving stone building in the city of Vologda. It was constructed between 1568 and 1570 under personal supervision of Tsar Ivan the Terrible in the period when Vologda was the capital of the Oprichnina lands in Russia, and completed in 1587. The cathedral is located on the right bank of the Vologda River, just outside the former fortress known as the Vologda Kremlin. Osip Dmitrievich Startsev was a Russian architect who mastered both Muscovite Baroque and Ukrainian Baroque idioms during the early part of Peter the Great's reign. His father Dmitry Startsev was the architect responsible for the completion of the Arkhangelsk Gostiny Dvor in the 1680s.